Where to Buy BlueMax Mini Blocks, BlueMax Mini Blocks Rat Mice - 16 Lb - $117.95 for Sale with Fast Free Shipping! BlueMax Mini Blocks Rat Mice - 16 Lb contains difethialone is the most advanced single feed anticoagulant rodenticide. Formulated through a unique grinding process, food grade grains and special mold inhibitors are combined with an optimum quantity of paraffin making BlueMax mini block the ideal maintenance rodenticide. Only BlueMax blocks deliver this combination of attributes making them the perfect choice for maintenance control of mice, Norway rats and roof rats, particularly at audited accounts. Additionally, BlueMax mini blocks are manufactured with rodent gnawing edges and a center hole for securing that prevents rodents from translocating blocks to sensitive areas. BlueMax is a low crumb/low scatter formulation perfect for the stringent requirements of food processing and commercial accounts. Place BlueMax mini blocks on vertical or horizontal rods in Aegis tamper resistant bait stations or other bait stations. Place BlueMax mini blocks between the rodents nest and/or food and water supply. 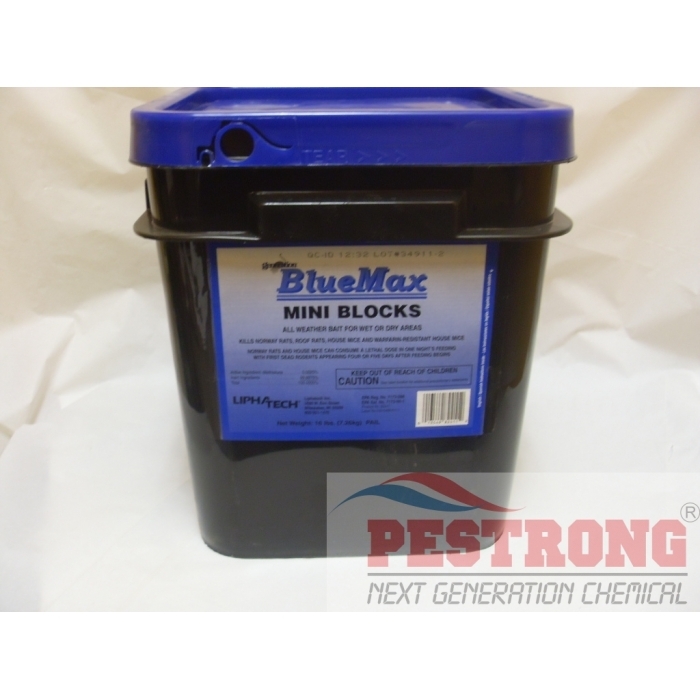 Maintain a consistent supply of BlueMax mini blocks until rodent feeding stops. Blue marker dye can be seen in droppings. really effective, I can hardly see mice that was bothering me to death anymore, awesome!